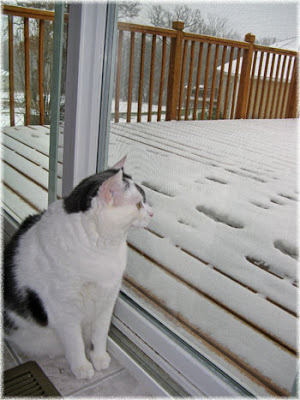 Here's our kitty cat contentedly watching the snow fall yesterday. We received about 2-3 inches. Tomorrow the forecast sounds much worse. Looks so peaceful. We got a break from the wintery mix they had forecasted. Thank goodness...still have a lot of errands to run before next week. Happy WW! Thanks for stoppin by my blog. Have a Merry Christmas! That is a beautiful picture! What a pretty cat! Happy WW. Too cute! You have to love a cat's curiosity. LOL! We were hit with a ton of snow too. :) It seemed like it came out of nowhere and fell fast. see, i would have tossed that kitty out there to watch them prance. I have 5 of them and it used to crack me up to put them in the backyard and watch them run back to the house. I do believe that cat was thinking, "Thank goodness I'm in here!" Great shot by the way. and thanks for stopping by my blog. Happy WW! It is so nice to watch from inside! Great picture! My cat would probably go out in it and then start whining to come back in. He is always sneaking out when we open the door and then we hear him meowing outside the door.